Archives are packed with people’s stories. From the everyday to the extraordinary, the records carefully looked after in our archives give us insights into the life experiences of individuals, families, and whole communities over the last several centuries. Some of the most powerful stories in the records we look after at ERO are of people’s experiences of the First World War. From the official to the personal, First World War records are full of stories that deserve to be discovered and shared. One of the privileges of working at ERO has been being able to explore the First World War stories within our collections, and to share them on this blog. Alf Webb, for example, joined up in 1914 at the age of 17, and served throughout the whole of the war. In 1992 he talked to a class of primary school students about his recollections of both the mundane details and the harsh realities of the war, from the lice which infested his uniform to the deaths of his friends. Fortunately, the teacher who organised his talk to her class made a recording of Alf’s talk, and deposited a copy with ERO. It has been said that listening to an oral history interview is the closest we can get to time travel, since we hear real people telling us about real events that they experienced. Listen to extracts of Alf Webb’s recollections of his First World War experiences here. Sister Kate Luard, meanwhile, was on the first boat she could get on to France after the outbreak of the war. She served on the Western Front throughout the war, working in some of the most dangerous conditions nurses faced. Somehow she found time to write home frequently, and her letters provide highly personal insights into her experiences as a nurse. One little bundle of letters she kept were written by relatives of men who she had nursed while they died. These letters often thank her for her care of sons, brothers and nephews, and ask about the men’s last days. Read more about Kate Luard in our previous posts about her. Other records tell us about how those at home managed through the tough years of the war, facing a very real prospect of invasion and potentially severe food shortages, while having to cope with the departure and often loss of loved ones. In the decades running up to the First World War, Britain had imported more and more of its food. When Britain entered the war on 4 August 1914, the country had enough wheat in stock to last just 125 days. Farmers at home were faced with the huge challenge of growing enough to feed the nation, with a shortage of male agricultural workers and a shortage of horses. Read about some of the efforts that went into producing enough food to keep the nation from starving. The home front also faced aerial bombardment for the first time. 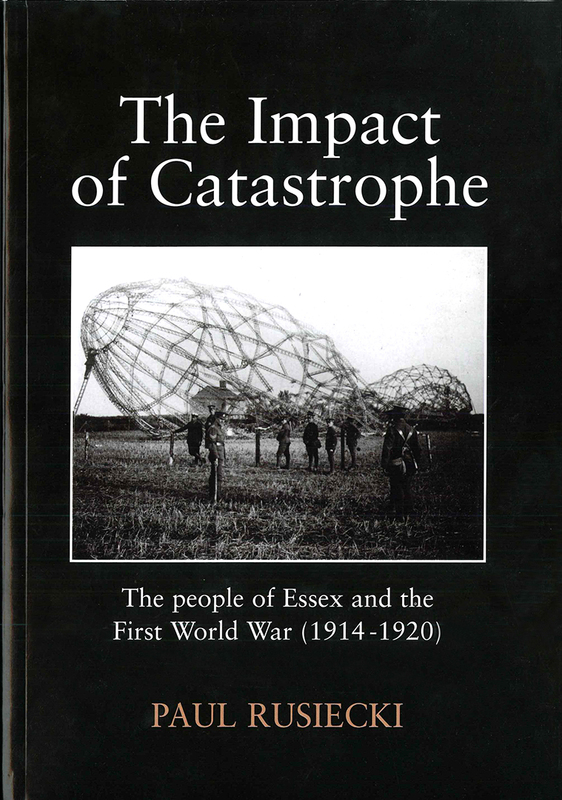 On the night of 23 September 1916 two Zeppelins crash landed in Essex, one in Little Wigborough, where the crew walked away largely unharmed, and one in Great Burstead, where all men on board were killed. Read eyewitness accounts of the Zeppelin crashes here. There is some light relief amongst the darkness of so many war stories. In February 1917 the Chelmsford Chronicle reported on a ‘Romantic Essex War Wedding’, in which Miss Clara Elizabeth Potter and Driver Charles T. Kidd had married, having never met but only communicated by letter. Read the Chronicle’s account of Clara and Charles’s romance here. What stories are still waiting to be discovered? If you have an idea for a project that would highlight a forgotten or unknown piece of your local First World War history, join us on Friday 8 December 2017 for a day of inspiration and practical advice on how to make your ideas into a reality. The day will include an introduction to Heritage Lottery funding streams for First World War projects, and showcase existing community First World War research projects taking place in Essex. There will also be a presentation by the Everyday Lives in War First World War Engagement Centre on how they can support independent researchers and community groups researching the First World War, and an insight into the resources and support available from the Essex Record Office. Find out more about the day and book your place here. Our Document of the Month for November 2017 is a scrapbook created during the First World War, which was recently purchased for the ERO by the Friends of Historic Essex. Caroline Wallace, a History MA student from the University of Essex, is currently undertaking a project to investigate its contents, and what it can tell us about life in Essex during the First World War. Throughout the years which mark the centenary of the First World War, the Friends of Historic Essex, the charity which supports the Essex Record Office, are running the Essex Great War Archive Project. The project aims to collect First World War documents relating to Essex to add to the ERO archive so they can be preserved for current and future generations, and to conserve and highlight documents already within the collection. The project has included purchasing relevant documents which have come up for sale, which otherwise would have remained within private collections. One such document is a scrapbook dating from 1915-1918 which was kept by Minna Evangeline Bradhurst of Rivenhall Place (now catalogued as Acc. A14491). The book contains material from 1820 onwards, but primarily covers the First World War period from 1915 to 1918. This scrapbook is part of a set of four , the other three all being in private hands, although the Essex Record Office does hold microfilm copies of them. Minna was born in 1865 to an old Essex society family, the Woods. She married Augustus Maunsell Bradhurst, an American, in 1893, and the following year the couple had their only child, a daughter, Christine (sometimes known as Heaven). In later life, one of Minna’s contemporaries described her as ‘a most amusing and delightful lady, of great character, and always dressed as through for a Buckingham Palace garden party’. The scrapbook includes much of Minna’s life which was not war-related; for example, several pages are dedicated to press cuttings about her own wedding, detailing the outfits of the bridal party, the gifts given, and the names of those who attended. The majority of the book, however, dates from the war years. During the time that she was compiling this scrapbook, Minna witnessed the impact of the First World War on her family, society and the country. As a lady of independent means, and with time on her hands, Minna’s scrapbooks cover every aspect of her life. They hold a detailed, and personal, account of what she held to be important; the society people she took an interest in, any mention of her family in the local and national newspapers (numerous pages are dedicated to such press cuttings), photographs of loved ones and of interesting places, invitations, tickets, concert programmes, and letters that delivered both good and bad news. Minna was the niece of Field Marshal Sir Evelyn Wood, one of the highest ranking, most experienced and well-known military men of the age. Minna took a great interest in her uncle’s career and achievements, and included a huge number of press cuttings about him in her scrapbook. Another cutting describes Minna winning a silver cup at a fete in Ilford for being the Essex resident with the largest number of relatives involved in the war – 64 uncles, cousins and nephews were with the armed forces in one way or another, and several female relatives were engaged in various kinds of war work. Large amounts of the volume are dedicated to the war work of Minna’s daughter, Christine, who was in her early 20s during the war years. Christine volunteered as a general service Voluntary Aid Detachment (VAD) worker at Earls Colne Auxiliary Hospital and put her considerable artistic talents to use putting together fundraising concerts and events to raise money for the Essex branch of the Red Cross Society. Not only did she organise these, but she also wrote many of the plays and songs, and performed them on stage. Included in the scrapbook are many of the concert programmes from these events. Minna’s husband, Augustus Bradhurst, volunteered as a Special Constable, and later in the war became a naturalised Briton and joined the Essex Volunteer Regiment. The scrapbook includes several pictures of him in uniform and on maneuvers in the county, along with letters about his appointments. The material in the scrapbook has suggested several avenues for further research, some of which will be published on this blog in the coming months. The scrapbook will be on display in the Searchroom throughout November 2017. If you would like to find out more about life in Essex during the First World War, join us on Saturday 25 November 2017 for the Friends of Historic Essex Autumn Lecture, which will include two talks on the Essex coast during the First World War; find out more here. If you have a First World War project of your own that you would like to get up and running, join us for a First World War project Discovery Day on Friday 8 November 2017; full details here. This month’s Document of the Month is a small part of the story of how Britain was saved from starvation during the First World War. 100 years ago our ancestors were facing a food crisis. When Britain entered the war on 4 August 1914, the country had enough wheat in stock to last for just 125 days. In the decades preceding the First World War Britain had increasingly relied on imports of food, and by 1914 60% of its food supply was imported. Between 1914 and 1917 these imports were increasingly under attack by German U-boats; by 1914 the Germans were sinking one in four merchant ships in the Atlantic. Farmers at home faced the huge challenge of growing enough food to feed the nation. Not only did this mean bringing more land under arable cultivation than ever before, it meant doing so with a shortage of male agricultural workers and a shortage of horses. In an effort to make sure the nation had enough to eat, in late 1915 the Board of Agriculture called for counties to set up War Agricultural Committees. 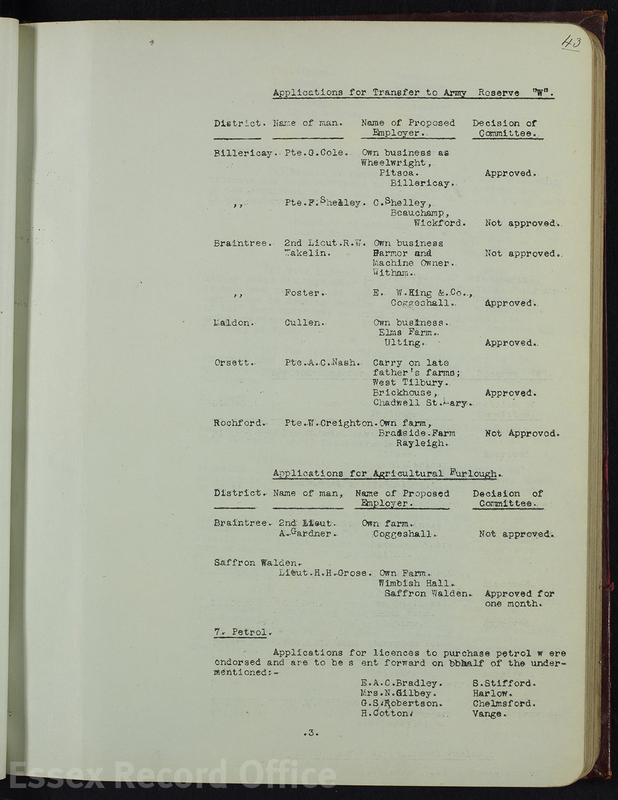 The records of the Essex War Agricultural Committee, today looked after at ERO, can give us valuable insights into the efforts that went in to producing enough food to keep the nation alive. The War Agricultural Committees were intended to ensure greater productivity of agricultural land and to increase the amount of land under cultivation. Despite their work, by December 1916, the Board of Agriculture was extremely concerned at the decrease in acreages of particular crops, when compared with the previous decades. A meeting that month noted that the combined acreage for the production of wheat, barley, oats, beans, peas and carrots in Essex had fallen from 428,904 in 1874 to 324,352 in 1914. Most of this decrease was due to a drop in wheat production, which was increasingly imported from the USA. In January 1917, a new committee was formed from members of the existing Essex War Agriculture Committee. The Executive Food Production Committee, later renamed the Agricultural Executive Committee, were required to oversee improvements on an almost full time basis. In their meetings, members discussed the loans of equipment and horses; requests for petrol, the housing of prisoners of war (often in workhouses and camps) and the employment of women on the land. In extreme cases, they could also arrange for the removal of tenants where the land was not being farmed to their approval. It is clear from an early stage that there were tensions between the agricultural committees and local military tribunals concerning agricultural workers. The minutes often include decisions regarding applications for exemption from call up on the grounds of work of national importance, requesting a transfer to army reserves or release from military service and for temporary leave. At one such meeting 100 years ago this month, the Agricultural Executive Committee approved a number of applications on these grounds. An H. J. Willett was granted a voucher to remain in employment as a tractor supervisor in Chelmsford and a Private G. Cole was allowed to join the army reserves in order to continue as a wheelwright at Pitsea. This reminds us that farmers and agricultural labourers relied on other skilled workers to maintain and improve production. It would be interesting to see whether the number of applications for exemptions increased as the war progressed and the need for greater production and for more men in the armed forces intensified. It is thanks to the efforts of all of those men and women who worked against enormous odds to keep the nation fed during the First World War that Britain never faced famine. Today, 27 July 2016, marks exactly 100 years since the execution of Captain Charles Algernon Fryatt by the German army in Belgium. He was tried by a military court despite being a civilian, and his death sentence was carried out just two hours after his trial, provoking international condemnation. Fryatt worked for the Great Eastern Railway (GER) Company, captaining steam ships which sailed between Harwich or Tilbury and Rotterdam in the Netherlands. The ships carried post, food supplies and sometimes refugees fleeing the continent. The ships continued to sail during the war, despite the dangers of enemy warships and submarines, blacked out coastlines and floating mines. Here we take a look at the story of Fryatt and the crew under his command as told through the pages of the GER magazine. Fryatt lived in Harwich and had joined the GER continental service as a young man in 1892. By the outbreak of the First World War he was a captain, and between the beginning of the war and his capture he made 143 trips across the Channel. The GER ships faced dangerous journeys during the war years, and on more than one occasion were hassled by German submarines. It was a run-in with a German submarine that ultimately led to Fryatt’s capture and execution. On March 2nd, 1915, about noon, near the Schouwen Bank, the ‘Wrexham’, proceeding to Rotterdam, was chased for 40 miles by an enemy submarine. Deck hands assisted the firemen to get every ounce of speed, and the enemy’s signal to stop was ignored. They made sixteen knots out of a boat which could hardly be expected to do fourteen knots, and dodging shells and floating mines, as well as the submarine, Captain Fryatt got his boat safely into Dutch waters. She entered Rotterdam with funnels burnt and blistered, the crew black with coal-dust. A couple of weeks later, on 28 March 1915, Fryatt had a second meeting with a submarine, this time while in charge of the s.s. Brussels. A German submarine was sighted nearby, and the Brussels being unable to outrun it, Fryatt took the decision to attempt to ram it. He ordered the engineers to get all possible speed from the ship, and steered it straight at the submarine, which was forced to dive. Fryatt and others in the GER service were awarded watches for their bravery, but the Germans had different thoughts on the matter. After the tiring work of providing for the refugees on board the “Brussels” they were resting, when at 1.30a.m., June 23rd, they noticed the stopping of the engines and heard noises on deck. Chief Steward Tovill said there was trouble and told them to get their life-jackets on. The ship was the prize of five torpedo boats and the Germans were on board. The captain had been hailed in English. For the sake of the women and children he sent no wireless message: if it had not been for them there is little doubt that the Germans would not have been able to take the ship whole. During the journey to Zeebrugge and then Bruges, ‘the captors on the way enjoy[ed] a most hearty meal. They called for wine but fortunately, think the stewardesses, there was none on board. The stewardesses were kept busy for some five hours serving the Germans and comforting the unfortunate weeping refugees’. According to the GER magazine, when the Germans wondered at the calmness of the stewardesses and asked if they were not afraid of being shot, ‘“We are Englishwomen” was considered sufficient reply’. The crew of 40 men and 5 stewardesses was taken to Bruges and locked up in the town hall, before being scattered to various prison camps. Eventually, postcards from the crew reached Harwich, saying they were well enough but in need of aid packages. Fryatt sent his wife a letter from Ruhleben on 1 July; it only reached her on 29 July, just after his death. Fryatt and his second-in-command, William Hartnell, were interrogated for three weeks, and on 27 July 1916 were tried by a military court in Bruges. Fryatt was found guilty of attempting to ram submarine U33 on 28 March 1915 and was sentenced to death. The sentence was carried out just two hours later – Fryatt was tied to a post and shot, receiving 16 bullet wounds. His death left behind a widow and seven children, aged between 18 and 2. The execution of Charles Fryatt provoked a storm of protest in Britain, and was denounced in the strongest terms in Parliament and in the press. The September edition of the GER magazine, in one of its milder statements, said ‘one does not expect a European nation to murder its prisoners of war’. The murder by the Germans of Captain Fryatt, who commanded the Great Eastern Railway Co.’s steamship Brussels, brings the fact of German frightfulness home to the country in general, and Essex in particular. The gallant captain’s offence, in German eyes, was that he, in self-defence, attempted to run down and sink and enemy submarine, which by all international law, to which Germany herself subscribed, he was perfectly entitled to do. There seems little doubt, however, that the Germans had planned some time ago to capture the Brussels and her intrepid commander, and when the opportunity came they appear to have lost no time in placing Capt. Fryatt on a trial of a sort and condemning him to death, a sentence which was carried out with feverish expedition, so that the crime they had decided to commit might not be interfered with by a neutral nation…Of course the whole Empire is crying out for vengeance. In the sorrow which has so cruelly stricken you, the King joins with his people in offering you his heartfelt sympathy. Since the outbreak of the war, His Majesty has followed with admiration the splendid services of the Mercantile Marine. The action of Captain Fryatt in defending his ship against the attack of an enemy submarine was a noble instance of the resource and self-reliance so characteristic of that profession. It is, therefore, with feelings of the deepest indignation that the King learnt of your husband’s fate, and in conveying to you the expression of his condolence I am commanded to assure you of the abhorrence with which His Majesty regards this outrage. It was indeed a pleasure and a relief to see again the released stewardesses of the s.s. “Brussels.” Mrs. Elwood, Miss Elwood, Mrs. Stalker, Mis Bobby and Miss Smith have passed through a most trying experience and have done so in a manner of which G.E.R. women can be proud. In July 1919, the coffin was exhumed from its grave in Bruges in the presence of Hartnell and Fryatt’s brother William. The Chelmsford Chronicle of 11 July gives a full account of the day of processions and funeral services marking the return and reburial of Fryatt’s remains. The coffin was transported from Antwerp on HMS Orpheus, and was received at Dover with full military honours. To the strains of Chopin’s Funeral March, the coffin was carried to Dover station, and from there taken to London for a funeral service at St Paul’s Cathedral. Music was provided at the service by the orchestra of the Great Eastern Railway Musical Society, and the coffin was placed under the great dome of the cathedral. After the service, the coffin and mourners proceeded to Liverpool Street, and from thence to Dovercourt, where crowds awaited the return of their local hero. At the reburial, the Bishop of Chelmsford said that Fryatt was one of the representatives of the ‘self-sacrificing spirit of the English people’ during the great war. Next time you pass through Liverpool Street station, see if you can spot the memorial to Captain Fryatt, which today can be found near the exit onto Liverpool Street. On Saturday 16 July 2016 we will be screening The Battle of the Somme film here at ERO. The Battle of the Somme is one of the most infamous engagements of the First World War. Beginning on 1 July, it raged for 141 days. Nearly 20,000 British soldiers were killed just on the first day of the battle, and over 30,000 were wounded. The Battle of the Somme film was shot during the opening weeks of the battle. Released in cinemas in autumn 1916, it was seen by 20 million people, almost half the population of Britain at the time. The film is looked after by Imperial War Museums, who have re-released it in 2016 to show to audiences across the world. Following the screening, there will be a talk from Ian Hook, Keeper of the Essex Regiment Museum, on the Essex Regiment’s experiences at the Somme. The Battle of the Somme film screening takes place at the Essex Record Office, Wharf Road, Chelmsford, CM2 6YT on Saturday 16 July, 1.30pm-4.00pm. Tickets are free but must be booked in advance on 033301 32500. Recently, I was scouring the wonderful British Newspaper Archive and, as so often happens when one has such a treasure trove of stories to explore, I got sidetracked. A romantic wedding has just taken place at Epping, the contracting parties being Miss Clara Elizabeth Potter, late a cashier in a Bishop Stortford house of business, whose home is at Roydon, and Driver Chas. T. Kydd, R.F.A., of Belfast. The bride-groom joined Kitchener’s Army and went to France in June, 1915. He became friendly with a Roydon soldier, and together they fought side by side at Loos, Armentieres, and on the Somme. Miss Potter, as a Roydon girl, commenced sending parcels to the Roydon soldier, which he shared with his Belfast friend. Driver Kydd wrote a letter of thanks, and a correspondence was started, with the result that, although they had never seen each other, a marriage was arranged to take place as soon as the soldier got his first home leave. This has just happened, and Miss Potter met her unseen fiancé at Liverpool Street station, and the banns having been already published, they were married two days later. The little village romance has aroused much interest in the Roydon district, where the bride and her people are well known. I would argue that it is impossible to read something like that and not want to know more. Nothing further was to be had from the newspapers, so I headed to Freebmd.org.uk to find the marriage, thinking it would be easy to find. On entering the names ‘Charles Kydd’ and ‘Clara Potter’ getting married in 1917, however, the site drew a blank. No results. Perhaps the story was a myth or a misunderstanding after all, and an expectant Clara never waited for Charles at Liverpool Street station, full of anxious excitement. Knowing, however, that often records are not as straightforward as they should in theory be I was undeterred, and tried various searches until I found a potential match – a Charles T. Kydd marrying a Clara E. Benham in Epping in 1917. Everything was right except for the bride’s last name. A bit more digging on Ancestry.com later, and I had an explanation. Clara was born in 1884, and her mother, Rosa Elizabeth Benham, was unmarried. In 1888 Rosa married Jonathan Potter, and from that point Clara appears in some records as Potter and others as Benham. Another lesson, so frequently learned in genealogy, that names are not always as straightforward as we might imagine. In the last census before her marriage, in 1911, Clara was boarding at a house in Bishop’s Stortford, and working as a book-keeper at a butchers, which fits well with the description of her in the newspaper article. Having untangled the essentials of Clara’s story, it was time to tackle Charles’s. By a stroke of good fortune, his army service record has survived, although it is one of the shorter ones. Charles Thomas Kydd was born in Belfast in about 1884. He joined the Royal Field Artillery in late August 1914, aged 28. His attestation papers describe him as being 5’5” tall, with a dark complexion, blue eyes, and dark brown hair. He had been working previously as a labourer. His next of kin was his brother, Sgt James Kydd, of the Royal Irish Constabulary in Longford. He was sent to France on 1 June 1915. He spent a few spells in hospital during his military service, the last of which was in April-May 1918 after being gassed. He was awarded the three First World War service medals, the 1915 Star, Victory Medal and British War Medal, known as ‘Pip, Squeak and Wilfred’. Charles and Clara moved to London after the war. Electoral registers tell us that in 1924 they were living in Camberwell, and between 1927 and 1930 they were in Norwood, Lambeth. A potential death record for Clara would mean that she died in 1943, aged 59, but after that the trail goes cold. It has been satisfying to uncover this much of their story so far, but I am still left with unanswered questions – the kind of questions that civil registration and census records can’t answer. What did Charles and Clara think of each other when they met for the first time, two days before their wedding? Was their marriage a happy one? What was Charles’s experience of the First World War like? Do their love letters survive somewhere? If you have a story of your own that you would like to trace, we have a guide on family history and one on researching First World War servicemen. You can use the British Newspaper Archive and Ancestry.com for free in the ERO Searchroom or at your local Essex library. Jessamy Carlson recently published a post on the National Archives’ blog about the First World War phenomenon of giving babies war-related names. Jessamy found 1,634 babies with such names, with 1,229 babies named after battles. The most popular battle to name children after was Verdun, with 901 babies given this name in 1914-1919. Verdun was one of the longest battles in human history, fought over 303 days from February to December 1916. Recent estimates put casualty figures at 976,000. By coincidence we recently came across an Essex baby born in 1916 named Nancy Verdun, christened in Goodmayes in 1917. She was the daughter of bus driver Harry Miles and his wife Anna Louise Miles, who lived at 17 Percy Road. Verdun was by far the most popular battle baby name, with a peak in the second quarter of 1916 as the battle raged. Jessamy also identified two other categories of war-related baby names – ‘hero babies’ and ‘end of war babies’. Hero babies are those named after significant First World War figures, such as Edith Cavell, Field Marshall Haig, and Lord Kitchener. End of war babies were those with names such as Peace and Victory. Nationally, 25 babies were named Cavell in 1914-1919, and 3 of them were in Essex. Of 11 babies nationally named Haig, 2 were born in Essex, strangely enough both in the Romford district. I can find only two babies named Peace (both registered in Edmonton so potentially actually in Hertfordshire), but 11 babies named Victory – including Victory D Tipple, born in Romford in the third quarter of 1919. One wartime name which as far as I know is unique to Essex is Zeppelina. Zeppelina Clarke was born in the early hours of the morning of 24 September 1916, the night that two Zeppelins crash-landed in Essex. Zeppelin L32 crashed in Great Burstead, with no survivors, and L33 crashed in Little Wigborough, narrowly missing some farm cottages. The crew of L33 walked away largely unharmed. In nearby Great Wigborough, Mr and Mrs Clarke welcomed a baby girl, and their doctor suggested naming her Zeppelina, to mark the extraordinary circumstances of the night of her birth. It is hard to understand today why people might have named their children after such terrible events as wartime battles, perhaps battles in which close relatives may have been lost. It would be fascinating to know how the babies given these names felt about them as they grew up – if anyone has any insights do leave a comment below.